1. “Like” Maria Mind Body Health on Facebook. 3. Leave a comment below on how your health has gotten better with the grain free and sugar free lifestyle! A winner will be picked December 27th and posted on Maria Mind Body Health Facebook page . Good Luck! 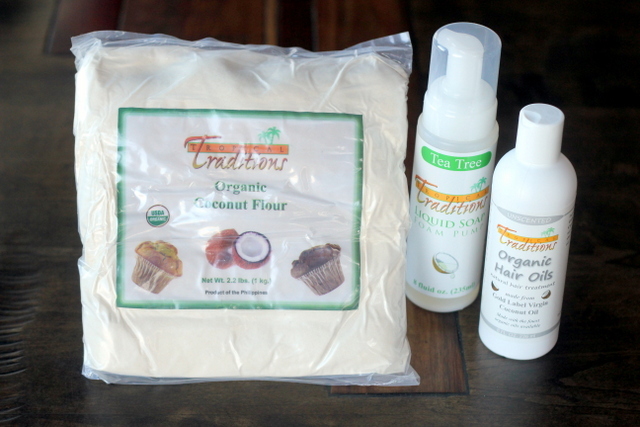 Thanks to Tropical Traditions: The Best Place to get Virgin Coconut Oil. “I started yo-yo dieting and exercising when I was 8 years old even though I was a slim child with no genetic tendency towards being even slightly overweight! I had started baby ballet a few months prior and was so gifted a dancer that in just a month I was moved to the advanced ballet class with the older girls and was (apparently) even better than all of them. My ballet teacher who was once a prima ballerina was so impressed by my ability that she pulled my mom aside and I had the ill luck to have overheard this conversation. She told my mom that if I continued to dance that I would someday be a prima ballerina assoluta. (I had to look up this definition when I got much older but at 8 years old I had no idea what kind of compliment I was being given). But THIS I remember…she said that for me to be a ballerina I would have to go on a strict diet because I was not a ‘skinny’ girl. That actually my (slim) frame was not ideal for ballerinas and it would hold me back. The ballet world would think I was too ‘fat’ and my body was not ideal. There. My life was changed at that moment. I started a lifelong struggle with body image at that moment that I heard I was too fat. 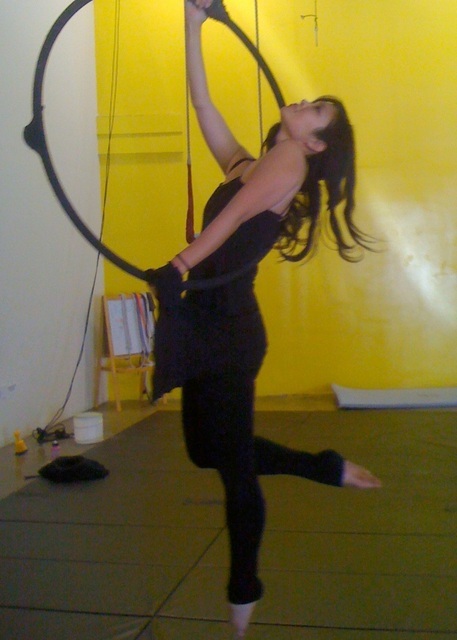 And even though I stopped dancing only 2 years later, the dieting and exercise continued. I would do 45 minutes of aerobics and toning in my room with my door closed and I was only 8 years old. I never had an eating disorder but I was definitely obsessed with my weight. My eating was either feast or famine because I could never stick to a real diet. I had no concept for what was healthy and what was right. I went about ‘dieting very blindly. And because I could never stick to an actual ‘diet’ i actually started gaining weight. All the feasting was catching up to me which made me try more starvation diets only to feast later on. Because i never lost weight and I would hide my binge eating, my mom never knew how obsessed I was with my weight and my body. No one knew. It was my own secret. To make a long story short, everyone in my family was thin except for me…which made me even more obsessed. I have been on every diet I can think of and have been to countless nutritionists with little success. I was really at the end of the line and I always felt trapped in my body. I’m an emotional eater and have a major sweet tooth. Once I start I can’t stop. I once went on a sugar binge that lasted almost a year. I felt like crap every single day! She mapped out a great eating plan, but more importantly recommended supplements to curb my moods and emotions–which was at the crux of my emotional eating. Since then, I have bought every one of her cookbooks. I feel very educated about health and eating and can consciously make the right choices. By the way, I have made almost every one of her desserts and ate it guilt free!! But I slowly stopped craving sweets altogether. When you don’t deprive your body of something, it stops craving it. Now, I am healthy at 5’6″ and 117lbs and am no longer dieting or going crazy about my weight and body which had consumed the better part of my life. I can live and enjoy life the way I was meant to…something I haven’t felt since baby ballet. The liver can become congested from not only the foods you eat, but all of the make up and soaps you use on your skin! I had one client who had her liver enzymes go back to normal once she ditched all of the lotions and make-up products she was using! Like every American, you’ve been flooded with emails of new miracle diets, and wondering why they don’t work for you. Could it be as simple as cleansing your liver? When the liver is overloaded and toxic, every organ in a person’s body is affected and weight loss efforts are stalled. Some signs of a toxic liver are weight gain, cellulite, abdominal bloating, indigestion, fatigue, mood swings, depression, high blood pressure, elevated cholesterol, and skin rashes. Many people struggle with weight gain and a sluggish metabolism most of their lives, and go through lots of yo-yo dieting unsuccessfully. “So why doesn’t anything work?” You may have been tackling the symptom when we should be addressing the cause; weight gain is often due to poor liver function.The liver performs more than 400 different jobs, and is the body’s most important metabolism-enhancing organ; it acts as a filter to clear the body of toxins, metabolize protein, control hormonal balance and enhance our immune system. The liver also plays a role in migraines. If this vital organ is overloaded with toxic substances, it can cause inflammation that triggers migraine pain. If you have tried many ways to improve your health and energy level and nothing seemed to help, it is possible that your tired liver is triggering your difficulties. If you notice that you are more edgy, easily stressed, have elevated cholesterol, skin irritations, depression, sleep difficulties, indigestion, kidney damage, brain fog, hypothyroidism, chronic fatigue, weight gain, poor memory, PMS, blood sugar imbalances, or allergies, your liver may be to blame. Restoring liver function is one of the most essential actions you could ever do for your health. When the liver gets congested it will remain that way and get worse until it gets cleaned and revitalized. If you want more ideas on foods to eat for your liver, see the chapter TIRED TOXIC LIVER in my Secrets to a Healthy Metabolism Book. 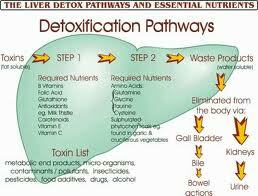 In addition to diet, supplements also help speed up cleansing of the liver. Click HERE to find my favorite. I guess it is “thyme” for a bath! 1. Contains Highest amounts of Antioxidants: lutein, zeaxanthin, and many others. If you are cutting out fruit to lower the sugar in your diet, herbs like Thyme are way higher in antioxidants than fruits anyway! 2. 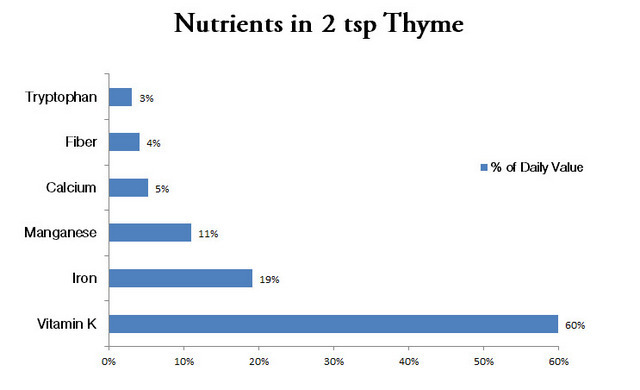 Thyme is one of the richest sources of selenium, potassium, calcium, and iron! No need for those potatoes and bananas to get your potassium in! 3. Thyme contains Thymol: an essential oil that is antiseptic and anti-fungal. 4. High in Vitamin C: There is something called a “phagocytic index” which tells you how rapidly a particular lymphocyte can gobble up a virus, bacteria, or cancer cells. We know that glucose and vitamin C have similar chemical structures, so what happens when the sugar levels go up? They compete for one another when entering the cells. And the thing that mediates the entry of glucose into the cells is the same thing that mediates the entry of vitamin C into the cells. If there is more glucose around, there is going to be less vitamin C allowed into the cell. It doesn’t take much: a blood sugar value of 120 reduces the phagocytic index by 75%. So when you eat sugar, think of your immune system slowing down to a crawl. Simple sugars aggravate asthma, cause mood swings, magnify personality changes, muster mental illness, fuel nervous disorders, increase diabetes and heart disease, grow gallstones, accelerate hypertension, and magnify arthritis. Since sugar lacks minerals and vitamins, they draw upon the body’s micro-nutrient stores in order to be metabolized into the system. SO instead of reaching for an orange for vitamin C which has sugar, try adding thyme into your diet! 5. Thyme contains high amounts of B-6. 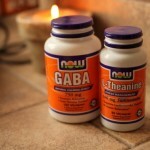 B-6 increases GABA which is our anti-anxiety neurotransmitter in the brain. GABA deficiency displays as emotional eating, anxiousness, nervousness, irritability, restlessness, allergies, blurred vision, clammy hands, butterflies in the stomach, dizziness, IBS, constipation, neuropathy, fibromyalgia, headache, insomnia, trembling or shaking, tinnitus, manic depression, and mood disorders. You don’t need all of these issues to be deficient in GABA. To read more on how to increase GABA through foods and supplements, check out my book: Secrets to Controlling Your Weight Cravings and Mood. NOTE: to get the benefits of vitamin K, you MUST eat fat! Vitamin K is fat-soluble, which means you need to consume a fat with it to reap the benefits. Are you taking your vitamin D supplements on an empty stomach, with an egg white omelet or a banana? Sorry to burst your bubble, but your vitamin D level will not increase; you need fat for absorption. There are over one hundred varieties of thyme, with the most common being Garden Thyme and Lemon Thyme. Lemon thyme has a slightly more-pronounced lemony fragrance, particularly good with this dish! Burrata cheese is fresh mozzarella cheese with cream in the middle of the ball....drool! Preheat the oven to 425 degrees F. Spread the cauliflower in an even layer on a rimmed baking sheet. Drizzle the oil evenly over the cauliflower and sprinkle with thyme leaves, salt and pepper (squeeze soft roasted garlic onto cauliflower if using). Toss to combine. Roast until the cauliflower is lightly caramelized, turning once, about 30 minutes. Garnish with burrata cheese and fresh thyme leaves. 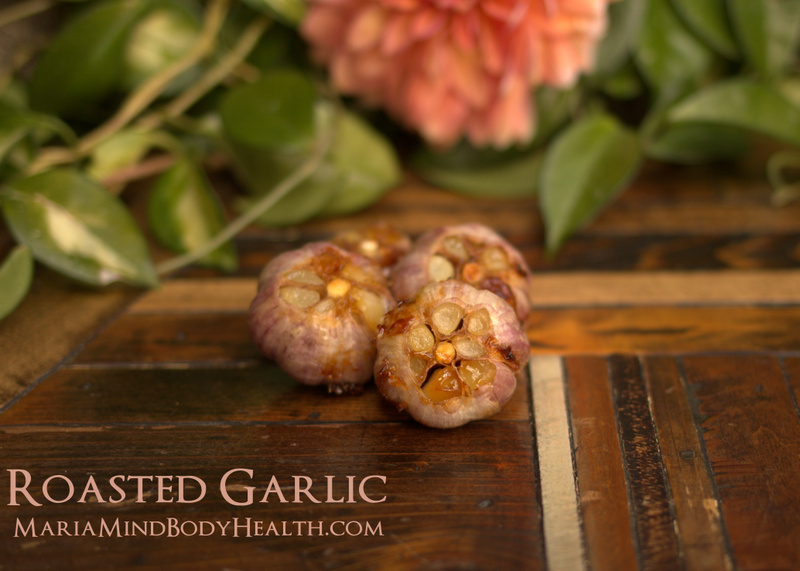 Roasted garlic is something so different than raw garlic. Craig and I were once eating at a Greek restaurant in St. Paul, MN called Shish. Craig’s kaboobs came with a side of the white “mash” which we thought were garlic mashed potatoes. It had the consistency of mashed potatoes and had a smell of garlic. We asked the owner what it was and he said roasted whipped garlic. We tried it and we had to ask again to make sure there wasn’t anything added because it really tasted like mashed potatoes. Nope, just roasted garlic. So, I came home and started making roasted garlic like mad. It is so tasty! I also tried making it in my slow cooker and it works perfect! I do a large batch and store extra in the freezer for meals and side dishes like the Roasted Cauliflower. 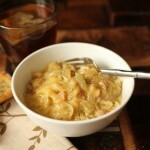 To find my easy Roasted Garlic recipe, check out The Art of Healthy Eating Slow Cooker. Thank you all for your love and support! my favorite holiday tradition is decorating the tree with my family. My favorite holiday tradition is going to have Dim Sum with my family. I enjoy mashed turnips and chocolate MIMs. Lost 20 pounds and less sinus infections. How’s that? My favorite holiday tradition is cooking yummy food for my family and getting to spend time with them. 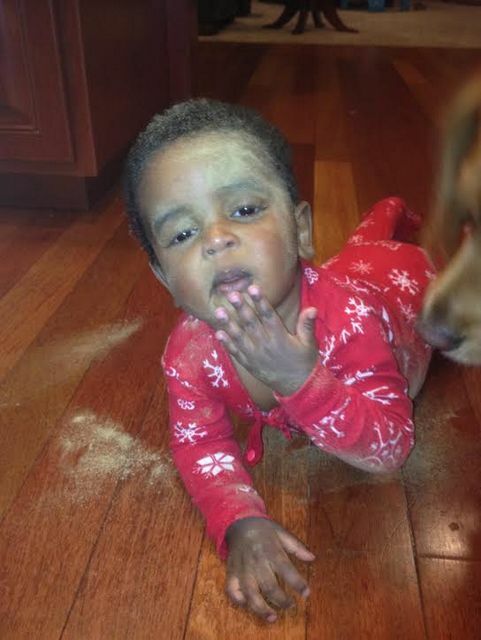 I love baking cookies for the holidays. I make them low carb, healthy, and they taste good. Coconut flour makes the best coconut crisp cookies. Definitely timing the tree with Christmas music on in the background!! My favorite holiday tradition is…hmm…the Christmas shows I get to play in. Grain Free and sugar free has done wonders for the fatigue and the foggy head. I am still working on keeping my weight down but I know this way of eating is right for me. Since starting my grain and sugar free lifestyle my whole outlook on life has improved. My mood is better, I feel better about myself, and I feel awakened to the fact that years of believing that fat was the enemy and whole grains were the healthier option was how I ended up overweight, tired, and moody. So amazingly thankful that I discovered your blog Maria and am looking forward to purchasing the 30-day accelerated program in the not too distant future. I love being with my entire family on Christmas Eve & eating food we’ve all prepared to share 🙂 this year the food I prepare will be healthified!! I would love to win this! Down 20 pounds in 4 months eating grain free & sugar free.. feeling good! I love spending time with my family & cooking/baking healthified treats! Getting together with family: family that you generally don’t see other than at Christmas. Love to spend holidays with family and friends enjoying the goodies and fun times. Maria’s healthy goodies have really helped make this holiday enjoyable. My favorite tradition is to spend time with the family and seeing my kids reactions when they open their Christmas gifts. I just love watching my husband play with our grandkids 3 of them under the age of 4. He turns in to a kid again! My glucose levels have gotten better, my pain levels have greatly improved and my leaky gut is healing. Less inflammation and bloating, and I am starting to lose weight too. One problem I have with the grain free lifestyle is that most of the recipes use almonds and having auto immune issues nuts cause me inflammation, pain and bloating. So I would love to get more recipes that do not include nuts. I always look forward to spending time with my hubby in the kitchen cooking and baking during the holidays. Cured most of the pain of fibromyalgia. My favorite holiday tradition is getting together with my 25 cousins 7 aunts and uncles and enjoying each other! Snuggling on the couch in front of the fireplace with my husband. Instead of using body lotions, I add a couple of drops of lavender and clary sage to some almond oil and rub that on my body right after I shower before I dry myself off. Works better then lotion, and I’m not getting all the toxins. My moods are more stable and I was able to identify a dairy allergy. My favorite holiday tradition when my daughter were teens was baking holiday cookies. Now a days it is taking those old family favorites and finding or creating substitutions that make them fit the GF and low/no sugar lifestyle that many of us have become accustom too. 🙂 And people like you and Against All grain and a few others are helping to keep our holiday Christmas Cookie traditions alive!!! Oh my!!! I cannot believe I forgot Dr Davis! Wheat Belly was my first reference to the GF life. He and his fact are what lead me to looking for all of you awesome folks on Facebook!! Thank you for all your help and support!!! Putting the tree up on thanksgiving night! and me being santa clause on christmas handing all the kids their presents that santa left under the tree! faces are priceless! I love Maria! She has helped me tremendously, now off to make some roasted garlic! My favorite holiday tradition is decorating the Christmas tree. We bring out the cocoa (coconut milk, organic cocoa and stevia ;), blast the Christmas music, light the fire and really make it an event. Singing Christmas carols and classics around the organ with my family. Our Christmas tradition is pulling out all the decorations and putting up the tree while watching Christmas Vacation. 7 pounds in the first week of 30-day meal plan: I did not think I had 7 pounds to loose! My energy is starting to get crazy high with no caffeine intake. My mood is stable and good! This is a timely post!!! Thank you for sharing your knowledge and your heart! I am just starting to cut it out of my diet. This prize would be great! Ever since I started eating grain-free and sugar-free, I lost weight and feel so much better! I have lost 30 pounds and I feel great. I have more energy. My favorite tradition is opening the Christmas stockings!! My favorite holiday tradition is Christmas Eve celebration at my parents’ house with the extended family and then returning back there in the morning with my sisters and our families to open up gifts together! 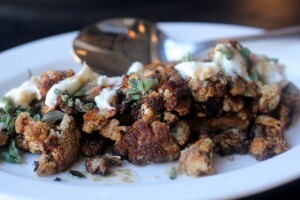 I’m always looking for new and tasty ways to use cauliflower. This looks and sounds fantastic! Lost weight and feel great! Turkey dinner with my family& going to Midnight Mass. to be honest, I haven’t enjoyed the holidays since I’ve developed an ED. it used to be sitting around the table with my family. making old fashioned potato candy! I love tropical traditions and would put the product to good use!! Taking vacation from work and time with Family!!! OH, thought i was supposed to state my favorite holiday tradition, I love Tropical Traditions! Great Company! My very thin hair is much healthier and thicker since I gave up sugar and wheat! Being able to spend time with my family without worrying about other issues or events. Thanks for the giveaway! Just ordered your new book! I love all of your recipes and info. thanks for all the work you do. Merry Christmas. All of the info is great, but sometimes I feel overwhelmed with trying to learn the right things to do (especially after learning so much false information over years of dieting.) I can’t wait to have the glowing reports others are having. I am slowly loosing weight. If I would exercise I would loose more plus the benefits to every system in my body! Christmas baking is a favorite holiday tradition! Feel better and have more energy. Tropical Traditions is how I learned about the benefits of coconut oil which I’ve now been using for over 8 years. Favorite Christmas tradition would be a toss-up between hunting for the perfect Christmas tree (includes hiking, occasional wild animal sightings, hot chocolate, and 2 ridiculously happy dogs running free!) or the nightly Christmas movie marathons…one every night til Christmas Eve. watching the Christmas movie with the family. 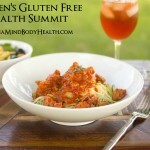 Grain-free and sugar-free has helped my whole family to feel and look better! I love making all my own Christmas cards! I’ve been doing it for about six or seven years now! Organic hair oils – just what I need for winter. I love burrata!! I love coconut products too! I love all my favorite Christmas movies. White Christmas all time fav. Giving something homemade is what I like to do at Christmas. Grain free, sugar free diet helped me loose 20 pounds and I have so much energy and feel muuch better overall! !! Just starting this journey. Thanks for all the information. The grain free, sugar free diet has reduced my migraines tremendously!!! Now I can look forward to my favorite holiday tradition….making “healthified” cookies!!! My holiday tradition is cooking a lovely feast for my family at Christmas and New Years and letting them try my healthy versions of yummy foods. This year I am adding in the Amazing Bread, I just love it and am in the process of making some now. I am in the process of recovering from anorexia and I’ve had way less emotional outbreaks! favorite holiday tradition is a christmas eve gathering with my family! I have a question maria, are Joseph’s lavash healthy or are la tortilla factory low carb high fiber tortillas better? I feel like a different person since eating the Maria way! Allergies/sinus issues have improved, & I can’t tell you how long it’s been since I’ve slept more than 4 solid hours/night! 😉 thanks!! I am a beginner on this journey. Love the changes already! We love to spend time together on the holidays. I like to make egg nog French toast! Hi maria I am trying to recover from anorexia with your advice that you gave me. I am 16 and my parents are Hispanic and they eat corn, tortillas, rice, beans, bread etc. and want me to eat like this, but I have tried to explain to them about low carb, but they won’t listen!!!!!! I wish you could explain to them somehow because they just won’t listen to me! What should I do? Should I keep trying or just gain weight their way? Yum Maria! Question. I love your recipes however I don’t want to bake or cook and I don’t want to eat bready or cake alternatives, I just want to eat clean. Can you do a chapter on that? foods to eat and a list of salads or something? Also I’ve gone from meat to pescetarian to vegetarian to vegan this year, which I have found suits me best in terms of cravings and overeating which I’m not doing now. I just want to make sure I’m getting enough nutrients. I have lots of tasty recipes in my slow cooker book. As for nutrients, this is a great read. You can get all you need pretty much from meats and healthy fats. I am so new at this and am still learning but since i’ve gone grain-free my debilitating menstrual cramps have gone away.. and 3 year old ceases to have constant eczema patches all over her body. Looking forward to learning more! Since adopting a grain free diet, I sleep better, I feel better, I have less joint pain and I can control my weight a bit easier. At any given time in the last two weeks, since I found you, at least 5 tabs remain open in my browser with your recipes. Fried Cauliflower is a very popular dish in Lebanese cuisine, and a favorite in my Lebanese family. So far I haven’t come across your thoughts on frying. Although I like them roasted I really love Cauliflower fried with tahini sauce. Thoughts? Thank you!! Maria you have literally changed my life!